Knowing what to wear to a funeral can be confusing. Almost anywhere you go now, you'll see more casual attire than in the past. However, there are still some places where you should respect tradition, with funerals being one of them. When dressing for a more traditional, formal funeral, you should always choose something that is conservative. Your clothing choice should reflect your respect and recognition that this is a solemn occasion in honor of a friend or loved one. Inappropriate funeral attire takes attention away from the purpose of being there. 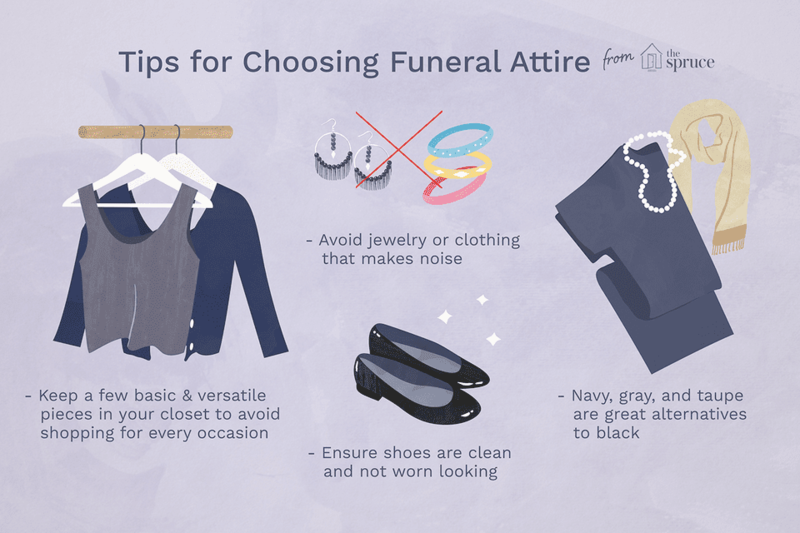 Whether you're attending a traditional funeral or a graveside service, it's important to follow the general guidelines for choosing the appropriate clothing to show your respects. It's always a good idea to have a few basic but versatile pieces in your closet so you don't have to go shopping for every event or occasion. Choose a subtle color. You may wear black or any other understated color, such as gray, navy, or taupe. You are there to honor the deceased and show support for the family and close friends. This is definitely not a time for you to wear loud, splashy colors that call attention to you. If you don't want to wear black, other great color options include navy blue, grey, and muted tones of other colors. Think conservative. Funerals tend to be solemn events. Take care to dress and behave in a conservative manner that reflects a reverent attitude. Conservative dress might include a nice business suit or a simple dress with a sweater or blazer. Take care to cover your shoulders and knees. Pass on the cocktail party look and opt for a more sedate appearance. Wear a hat. Although a hat isn't essential funeral attire, this is a perfect occasion to wear your favorite hat. Hats give a polished look and will complete your ensemble in a classic yet stylish way. Keep in mind your hat should not be gauche, outlandish, or big enough to obstruct the view of those sitting or standing behind you. Tone down the jewelry. Many stylishly elegant women will want to include their jewels, even during a funeral. Don't go overboard with too many rings, bracelets, and necklaces. You definitely shouldn't wear jewelry that makes noise. Again, you want to reflect a mourning spirit without sacrificing style. Use shoe sensibility. A funeral is not the time to choose stilettos, strappy sandals, or shoes that are notoriously uncomfortable (no matter how fabulous they look). You are headed into what may be a high-stress situation, and the last thing you want to worry about is foot pain or discomfort. Choose comfort over glamour, and you will be grateful. Funerals normally involve a great deal of standing and walking, especially if you are planning to attend the graveside service. Be prepared for inclement weather. Bring a trusty umbrella and an extra handkerchief or two. It's better to be safe (and dry) than soggy. Wear something conservative. A black, gray, or navy conservative-cut suit is a perfect choice for a funeral. Regardless of the suit you choose, you should wear a crisp white collared shirt with a tie. Avoid loud colors. If you are a hat wearer, feel free to wear one to the funeral. A nice fedora style is a great choice. Complete the look with a classic black or dark trench if the weather calls for it. Tone down the jewelry. Try to avoid any jewelry other than a wedding band and a watch. Remember your goal is to show respect and reverence. You don't want to draw attention to yourself with flashy or noisy jewelry. Shine your shoes. Take an extra minute to shine your dress shoes before you go. This will complete a polished and elegant look that is not distracting. Be ready for the rain. Have an umbrella just in case it begins to rain. Extra hankies are nice if you need to offer a shoulder for comfort or support to a distraught loved one or friend. When dressing children for a funeral, make sure they are comfortable in what they are wearing. Dark attire is appropriate but not necessary as long as you keep their clothing subtle and understated. Make sure their shoes are clean and not worn looking. Avoid choosing cutesy dresses or faddish ensembles because you don't want to draw attention to them. What Is a Visitation Before a Funeral or Memorial Service? Are Flowers Always Appropriate for Funerals? Is It Okay to Have my Baby at Funeral Services? Get kid-friendly recipes, fun activities plus parenting tips delivered right to your inbox.